Undefeated World Boxing Association (WBA) super welterweight champion Austin "No Doubt" Trout will defend against Frank LoPorto on Friday, Nov. 11, in the main event of a ShoBox: The New Generation tripleheader LIVE on SHOWTIME® at 11:05 p.m. ET/PT (delayed on the West Coast) from Cohen Stadium in El Paso, Texas. The 12-round championship bout will be the second title defense for Trout (23-0, 13 KOs), of Las Cruces, N.M., and the U.S. debut for LoPorto (15-4, 7 KOs), of Victoria, Australia. In the ShoBox co-featured fights, undefeated prospect Jonathan Gonzalez (14-0, 13 KOs), of Puerto Rico, will face Gabriel Rosado (18-5, 10 KOs), of Philadelphia, in a 10-round junior middleweight bout and Michael Oliveira (15-0, 12 KOs), of Miami, Fla., will face an opponent to be announced in an eight-round middleweight bout. The tripleheader will be promoted by Gary Shaw Productions. The 26-year-old Trout won the vacant 154-pound title with a 12-round unanimous decision over Rigoberto Alvarez, the older brother of World Boxing Council (WBC) light middleweight champ, Saul "Canelo" Alvarez, on Feb. 5, 2011, in Mexico. A slick southpaw, the 2004 U.S. National Amateur Welterweight Champion, again traveled to Mexico for his first defense, registering another dominant unanimous decision, over David Lopez. LoPorto has fought all of his fights in Australia and New Zealand. The 33-year-old has rattled off three consecutive victories since his last loss against former world title challenger Daniel Dawson on Oct. 9, 2010. The fast-rising, 22-year-old Gonzalez was a member of the 2008 Puerto Rican Olympic team. Eleven of the well-rounded Gonzalez knockouts have come within three rounds and he has only gone past the sixth twice in his career. Gonzalez, who is coming off a 10-round unanimous decision victory over Richard Gutierrez on June 11 on ShoBox, is the No. 9-ranked contender in the WBA. 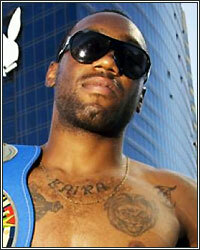 The 25-year-old Rosado has won four consecutive bouts since he lost to Derek Ennis in July 2010. Rosado, who has fought top prospects Fernando Guerrero and Alfredo Angulo, is far more experienced than Gonzalez and has gone 12 rounds twice in his career. The hard-hitting Oliveira was born in Brazil but fights out of Miami and trains with Glen "The Road Warrior" Johnson at Thump Fight Gym. The 21-year-old has knocked out five of his last six opponents and is now the No. 15th-ranked middleweight by the WBC. Curt Menefee will call the action alongside ringside analyst Steve Farhood and boxing expert Antonio Tarver. The executive producer is Gordon Hall, with Richard Gaughan producing and Rick Phillips directing. For information on SHOWTIME Sports Programming, including exclusive behind-the-scenes video and photo galleries, complete telecast information and more, please go the new SHOWTIME Sports website at http://sports.SHO.com.